In Memory of Matt - "Love Is Never Lost"
to Make YOUR Day Exactly as YOU Want It To Be!
. "PLEASE FEEL FREE TO POST AND VIEW COMMENTS"
My name is Pam and I am a Fully-Licensed and Ordained Non-Denominational Minister/ Professional Wedding Officiant serving WV, PA, OH, VA, KY, MD and other East Coast States. 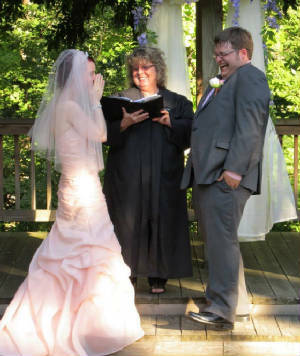 I officiate weddings at my home in Buckhannon, West Virginia and am always happy to travel to any venue of your choosing. I specialize in beautiful custom-written personalized ceremonies that capture the true heart and soul of a relationship and will go the "extra mile" to make your wedding or vow renewal UNIQUELY BREATHTAKING! "Thank you Pam for marrying us. You were so kind, accomodating, genuine and full of love on our special day. We so appreciate your time, willingness and thought in working with us from overseas to make this happen. With Love, Grace and Andrew." Every couple has a great story about how they met, how they wooed, and how they fell in love. That story should absolutely be shared with everyone and that is exactly what we will do together. . 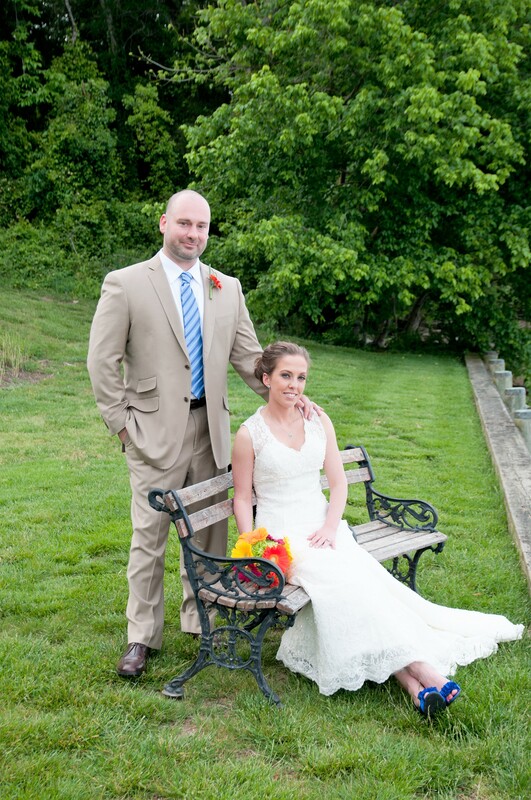 Ask Me How I Can Turn "Your Story" Into A Beautiful Wedding Ceremony! 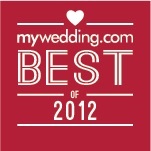 Do YOU Need a Wedding Officiant/ Minister for YOUR Special Day? Many couples have a hard time finding a Minister to marry them if they are living together prior to marriage, if they have been married before, or if they don't belong to a particular church affiliation or religion. My only requirements are that couples truly love each other, that they understand the importance and sanctity of marriage and that they have a sincere desire to be be united as husband and wife under God's blessing. That's it! Weddings are fantastic, but Marriages are Wonderful. And why are they Wonderful? Because they are ordained by God. Marriage was instituted by God Himself as declared in Genesis 2:18. "It is not good that a man should be alone; I will make him a helper comparable to him". Thereupon God created woman of man's own substance and brought her to the man. Our Lord Jesus honored marriage by His presence at the wedding in Cana of Galilee. And He confirmed it as a divine ordinance and a union not to be severed when He declared, "Therefore what God hath joined together, let man not separate". Matthew 19:6. Moreover, the apostle Paul set forth the sacred and exalted nature of marriage when he likened it to a mystical union that subsists between Christ and His Church. I am an ordained Non-Denominational Christian Minister licensed to officiate weddings and other life event services. I provide not only a quality product, but also a QUALITY EXPERIENCE and am professional in every way. My services are ALWAYS about YOU and my goal is your complete satisfaction. I will work with you to write YOUR story and I will make it a true feature of the day rather than just merely a ceremony that accomplishes a mission. Your ceremony will not only be one your guests talk about whenever they see you, but it will be remembered for years to come. It will be truly unique, truly reflective of your personalities and your story, and it will give your guests a gift of inspiration, of laughter, and of joy for you. I am prepared to perform your wedding ceremony or vow renewal in any location you choose, whether it be outdoors, in a church, or in the comfort of your own home. I will travel anywhere you would like to have your wedding and distance is not an issue. Or, if you prefer, you may also choose to hold your wedding at one of many picturesque locations on my countryside property. The love you share is a gift from God, and you are His special gift to each other. It would be my privilege to perform your wedding ceremony under His blessing and to not only offer you a fantastic wedding, but help you begin a wonderful marriage... a dance between three partners; you, your bethrothed and God Himself. "A cord of three strands is not easily broken". Ecclesiastes 4:12. I offer a wide range of officiant services and will work with you to make your wedding exactly as you envision. Whether it be a spur of the moment ceremony, an elopement or a wedding of any size, your ceremony deserves to be every bit as special as the love you share and regardless of length, it will be written with complete care and attention. I offer a full-service customized wedding ceremony, personalized to your style and taste and am prepared to perform either a traditional or contemporary service; or if you prefer, a nice blend of the two. Writing and public speaking are my strong points and this is where I do my best work. 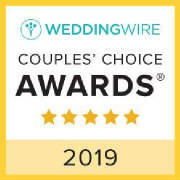 I like to talk with my couples, get a feel for their thoughts and feelings as to what they would like their wedding to portray and then write a ceremony that speaks for and about them, both as individuals and as a couple. Theme Weddings are another way of expressing your individuality and I can tailor your ceremony to correspond with any theme you choose. Including family members and pets as a special part of the ceremony is also becoming a popular feature and whatever your wedding vision is, I will work with you to make it happen. You may choose your vows from examples I provide or, if you prefer, you can write your own. We can include a Unity Candle, Sand Ceremony, Water Ceremony, Rose Ceremony, Breaking the Glass Ceremony, Box Ceremony, special readings, favorite scripture, family customs, anything you choose that would make it unique and meaningful to you. The possibilities are endless and limited only by your imagination and desires. Depending upon your location, we can handle the pre-marriage consultations by phone, by mail, or in person and I will work with you to make sure every detail is just as you want it. Your personalized ceremony will be written specifically for you and your betrothed, a beautiful reflection of you, your beliefs, personal desires and the love you share. Once written, I will either mail or hand deliver the ceremony draft to you for approval or further editing. My goal is your complete satisfaction and I will go the "extra mile" to capture the heart and soul of your relationship, making the finished product meaningful, memorable, and UNIQUELY BREATHTAKING. I bring my own PA, which works with or without electricity, so your guests will be able to hear the ceremony even if your venue does not provide one. It is small, self-contained and unnoticeable in photos. Following the wedding, I will provide you with a Wedding Portfolio, a Keepsake Marriage Certificate suitable for framing and a beautiful booklet containing a copy of your personalized ceremony. I will also file your marriage license with the proper town or city authorities and provide you with a copy of the same. A lot of times couples will have family members ask the blessing at the meal following the wedding, however if you would like me to perform this function, I would be honored to do so. My ultimate goal is to provide you with a quality experience and one that will leave a memory that is equally treasured years down the road, as it is the day following your wedding. I am sincere, easy-going and flexible and will do everything within my power to make YOUR day special... just the way YOU want it. Most of the comments I receive come from parents, relatives and wedding guests who sincerely thank me for a unique, heartfelt ceremony and memories that will last a lifetime. One mother told me, "I will never experience another wedding service more beautiful than this one. As I listened to your words, I kept wondering if you could possibly say something better or more meaningful than what you had already said, and each time you did. It was wonderful. Anyone would be privileged to have you perform their wedding ceremony." Another person told me "My family and I flew all the way across country to attend this wedding, and hearing your words made it worth every mile". Fees are structured to support time dedicated to writing and designing your ceremony. I custom-write each and every one of my ceremonies and no two are alike. This means that your ceremony will be one of a kind, totally unique to the two of you and there will never be another one exactly like it. Factors in determining the cost of your ceremony will include meeting time and travel, as well as time to write and officiate your ceremony. The fees are usually as stated on this page, but since every ceremony is unique, please e-mail me for a quote. Please be assured that all fees will be discused openly and agreed upon prior to booking and there will be no hidden charges. Additional services, such as travel beyond a certain distance from my office may be extra. I travel all over the East Coast singing, speaking and doing weddings so you just never know, I may be in your area at the same time you plan to have your wedding. No matter which ceremony package you choose, please be assured that I will do everything within my power to make your ceremony totally stress free so that all you have to do is smile, say "I do", and enjoy your day. NOTE: Every marriage must be solemnized under a marriage license issued by a clerk of the city, burrough, county or state that the couple chooses to be married in, in accordance with the provisions of the laws governing that particular state. If a ceremony of marriage is performed without a license, the attempted marriage is void, and the parties do not attain the legal status of husband and wife. Therefore, in order for your marriage to be legal, I must have your valid marriage license, in hand, prior to officiating your ceremony. "Pam is exceptional. We can happily say she was the best part of our day. There are so many ways to express how wonderful she is, but I think the best way is to share what the guests at our wedding said about the ceremony. * I thought our ceremony was the best - but this ceremony out did it!" * Your wedding ceremony was one of the most beautiful experiences of my life. * It was the most touching wedding ceremony I have ever been to, * I have never been to a more wonderful ceremony. It was touching, it was meaningful, and I will never forget it! * It was the best - it was the most unique - it was the coolest ceremony I have ever seen (we heard this statement or a version of this statement a lot)! I had many guests ask if Pam was a lifelong friend of ours because the ceremony was so personal that people thought we had known each other prior! Not only did Pam provide a beautifully written ceremony, but she was so genuine. She wanted to hear the stories about us and our family. She wanted to meet all of our loved ones. She wanted to be a part of our day in every way she could. We highly recommend Pam. I can safely say that she provided us with a ceremony that we will treasure for the rest of our lives. We appreciate her more than words can express." "Pam is amazing! She has a true gift for sharing her light and love. You instantly feel like family around Pam. From our first email and phone conversation I knew she was someone special. :) I highly recommend Pam for ANY venue. Thanks Pam!!! 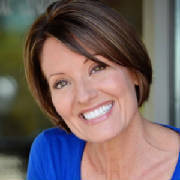 Cynthia Pensiero, Mrs. America 1996." * Mileage and travel fees apply to all ceremonies performed at locations other than my home in Buckhannon, West Virginia. 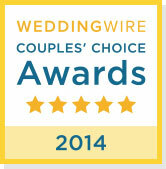 Are you planning a quiet, intimate wedding, vow renewal or elopement with just the two of you and a few select guests? If so, I invite you to pledge your vows at my Countryside home where you can enjoy the tranquil beauty of nature, peaceful gardens and all the lovely sounds that await you. The Ceremony is performed at my home, located in a quiet, wooded, country setting approximately eight miles outside the city limits of Buckhannon, West Virginia. The Countryside location is enhanced by wildlife, sounds of birds chirping and all the wonderful aspects of nature that the countryside is known for. See my Countryside Weddings and Vow Renewal Page at www.SweetSongMinistries.com/id146.html for complete details. This is a special Ceremony Package for the Bride and Groom ONLY. Many times couples want to wait for their "official" ceremony until they can better afford it, or prefer to hold it later on when all their family and friends can be present. In the meantime, though, they want to be legally married because they cherish the gift of love they have in one another and want to make their commitment official. The "I DO" [Signature] Ceremony is perfect in these situations and also beneficial in cases where, for financial reasons, it would be helpful to go ahead and get married in order to help make the process of purchasing a home easier, or because health insurance would be less expensive if the couple was married, rather than single. If this is your case, please feel free to contact me. I can meet you in your home, at a local park, or any other location within a 10 mile radius of the Buckhannon city limits. I will say all the meaningful things that will make your marriage legal, do a short exchange of "I DO' vows and you can be on your way with your own little secret to cherish until you decide you want to share it with the 'world". Also, as a special thank you, if you book me to perform your "official" wedding, the cost of your ceremony package will be reduced by the amount you paid for this one. "There is only one happiness in life; to love and be loved," (George Sand), and I would be honored to do this for you. * Return service of your signed Marriage License to the proper authorities along with a complimentary copy provided to you by return mail. If you just want to be legally married, without a Ceremony, and would rather seal your commitment in front of a Minister instead of going to the local Courthouse, give me a call. I can meet you in your home, at a local park, or any other location within a 10 mile radius of the Buckhannon city limits. I will do a short exchange of vows, give you a beautiful keepsake Marriage Certificate, and you will be happily married in less than 15 minutes. I will also give you pertinent name change information and forward your signed Marriage License to the proper officials with a copy to you by return mail. Many times couples would like to have a private wedding ceremony with just the two of them and a few select guests but hesitate to set a date because their finances won't allow it. The "Short and Romantically Sweet" is for those who want nothing more than to celebrate the love that is in their hearts. It can be officiated at any location of your choosing within a 10 mile radius of the Buckhannon city limits and the best part of all is that it's completely affordable. You may choose traditional vows, "I Do" vows or if you prefer, you may write your own. * A short, romantically sweet ceremony that focuses on the gift of love you are to one another. * Traditional Vows, "I Do" Vows, or you can write your own. If you want to be married without all the fuss and drama that sometimes goes along with larger weddings but, at the same time, don't want to compromise the beauty of a ceremony that is meaningful and full of love, the "Forever In Love" is the perfect choice. Your ceremony will be uniquely written to reflect the gift of love you have found in one another and includes many features that are not typically found in traditional ceremonines. Whether you choose an intimate exchange of vows with just the two of you, or a celebration that you choose to share with those closest to you, I "vow" to make it extraordinary. * A love-inspired ceremony that is tender, meaningful and uniquely beautiful. * Traditional Wedding Vows, "I Do" Vows, or you may write your own. * Joining of Hearts and Hands Ceremonial Add-On before the exchange of rings and vows. * Keepsake copy of your Ceremony. * Beautiful Rose Embossed Marriage Certificate. If you want a truly special Marriage Ceremony that you help to create, then look no further. The "Sweet Song Standard" includes all the elements of the "Forever in Love" but takes it a step further by offering you the flexibility to make it your own. Your ceremony will include customized vows, a ceremonial add-on and a reading(s) of your choice. Together we will craft a ceremony that refelcts your personalities and I will not be satisfied until the finished product fits you perfectly. * Your choice of vows from samples I provide (traditional, contemporary, religious, non-religious, funny... you name it). You can mix and match to create a vow that fits your personality. or you may write your own. * Wonderful tips on love and life to make your ceremony truly meaningful. * A Reading of your choice from samples I provide, or you can include one of your own choosing. The "Heart & Soul Personalized Ceremony" is a fully custom-written ceremony that is a true reflection of you, the love you share and your dreams for the future. Every couple has a song of love in their hearts that they want the whole wide world to hear and helping them express that song in words is what I do best. Many couples find the "Heart and Soul Personalized Ceremony" to be the perfect choice because in addition to being meaningful, love-inspired, and uniquely beautiful, it is wholly, 100% about them. And best of all... it's affordable! No one else knows better than you the sentiments you want to express to your soulmate and no one wants to witness point-blank the tender exchange of your love and commitment to one another than me. Together we will transform YOUR STORY into a uniquely crafted marriage ceremony that will be the true highlight of the day. * Your Story transformed into a one-of-a-kind ceremony that is personalized to reflect the true heart and soul of your relationship. * Elements detailing your love story; how you met, things you love about each other, your hopes and dreams for the future, all those special things that make your relationship the uniquely beautiful gift that it is. * Your choice of vows from samples I provide (traditional, contemporary, religious, non-religious, funny... you name it). You can mix and match to create a vow that fits your personality, or you can write your own. * Unlimited consultations by phone and/or email. I am willing to travel anywhere you would like to hold your ceremony and distance is not an issue. The fee will be based on the Ceremony Package you choose, and time spent in making your day absolutely perfect! I have a lot of resources available to me that would help enhance your ceremony and am prepared to use them to your advantage in making your ceremony the amazing work or art that you would like it to be. Mileage, Lodging and Air Travel, if required, will be added to all packages. Many venues have dedicated Wedding Coordinators who run Rehearsals for their couples; however, if yours does not, I would be more than happy to orchestrate one for you. I am always on site an hour prior to the Ceremony and can do a complimentary walk through at that time. Or, if you prefer to hold your Rehearsal the evening prior to your ceremony I can do your Rehearsal for an additional fee of $100. I can also send you a detailed Rehearsal Guide if that would be beneficial. Please note that lodging costs will be added to all packages requiring overnight stays due to a Rehearsal. This includes wedding music up to one (1) hour before your ceremony, the Bridal March or your choice of Processional and Recessional and any other music you might want played during your ceremony. If a Ceremonial Add-On is not included as a part of the Ceremony Package you choose, you may add one or more at a cost of $50 each. Please note that this charge is for writing the information pertaining to the add-on into your ceremony and does not include any of the supplies required to perform it. I do not furnish supplies for add-ons and they must be provided by the couple. Most supplies; candles, sand, vases, doves, boxes, etc. may be purchased from a local craft store or online distributor. See our Photography page at http://www.sweetsongministries.com/id172.html for complete details and samples of photos graciously shared by many of our satisfied couples. If you have not yet booked a Photographer to document your Wedding, we invite you to consider Abi Elle Imagery, Sweet Song Ministries' own Professional Photography Service. Having photos that truly capture the essence of your love story is important and that is always our goal at Sweet Song Ministries. Abigail Layman is the light behind the camera and the heart behind Abi Elle Imagery. Abby travels with Pastor Pam to document all ceremonies officiated by her, for ministerial purposes and we also make those photos available to couples who desire to make them a part of their memories. If you already have a Photographer, please be assured that Abby is totally unobtrusive and will not interfere with any Professional Photographers hired by you to photograph your wedding. Quite to the contrary, couples and guests, alike, find her smile a warming presence in the crowd. Each Photographer has their own unique style of documenting ceremonies and sometimes one Photographer will capture a moment that another does not. For this reason, we make our photos available to couples who would like to have them. This is an added-value option and purchase of these photos is completely optional. For those desiring to take advantage of this offer, pictures will be delivered digitally, with copyright privileges. We offer multiple photo packages geared to fit a variety of needs and make every effort to keep them affordable, while at the same time producing memories that you will be excited to share with family and friends for years to come. This is a great way to supplement your collection of memories; however, if you opt not to take advantage of this offer, please be assured that all photos will be kept on file for a period of one year in the event that you would like to purchase them at a later date. Please note that pictures following the ceremony will not be taken unless you designate ahead of time that you would like to obtain our services. Many couples have a family member perform this function; however, if you would like me to stay and give a blessing before dinner, I would be absolutely honored!!! I consider it a blessing to be a part of your special day and to be able to return thanks would be my sincere privilege. NOTE: I often officiate more than one ceremony per day and it is imperative that weddings begin promptly at the time they are scheduled. When a ceremony starts late it not only cuts into the next couple's time, it makes traveling stressful as I drive to the next destination. That being said, there will be a $50 per 15-minute late fee for weddings that do not start on time. This fee is geared to protect my couples from being inconsiderate of one another and to allow me to do the best job possible in providing each of my couples the great service they expect and deserve. If more than 15 minutes late I reserve the right to cut out part of the ceremony to compensate for the time difference. I do everything within my power to make your ceremony perfect and I want your wedding day to be a beautiful, memorable experience. Starting the wedding on schedule helps that to happen. Thank you for your consideration and I appreciate your understanding. The Couple gives permission and shall allow The Officiant to post a photograph(s) of them with The Officiant (or any other photos taken by the Officiant or her Representative during the wedding ceremony) on The Officiant’s website or other social media for viewing by the internet community. The Couple acknowledges that this is for promotional purposes only and they do not expect to receive any compensation of any kind. There shall be no expiration for this permission. ** I travel to various states and locations to perform marriage ceremonies so it is not feasible to set one standard rate that includes travel. Therefore, mileage, as well as air and lodging (if required), will be added to the above stated prices. Total cost will be discussed individually with each couple based upon your State and County requirements and your wedding destination, "
Mileage and time spent traveling to and from your venue location will be added to all packages. Lodging costs will also be added if destination is beyond two hours driving distance from home office in Buckhannon, West Virginia. ** Costs of air travel, if required, as well as round-trip mileage from home office to Pittsburgh International Airport will be provided by the couple. I officiate all of my own ceremonies and take great pride in the fact that each and every one is delivered with "heart" and "passion". Booking is first come first serve and dates will be held with a 50% NONREFUNDABLE deposit with final payment being due two weeks prior to the ceremony. If by chance you find it necessary to change the date of your ceremony, all monies will be fully transferrable to the new date, provided that my schedule permits and I am available to perfrom your service at that time. MILITARY DISCOUNT: As an expression of gratitude to our United States Military, it is my sincere honor and privilege to extend a 10% discount to all Active Duty Service Members, Retired Military and Honorably Discharged Veterans. [Valid Military ID or DD Form 214 Required]. Thank you so very much for your service and sacrifice. It is sincerely appreciated and I pray God's blessings upon each and every one of you. LET ME HELP TURN YOUR WEDDING DAY INTO A TREASURED MEMORY. I LOOK FORWARD TO SURPASSING YOUR EXPECTATIONS. I also perform House Blessings, Celebration of Life Services, Christenings, Baby Naming Ceremonies and other life event services. Contact me and let me know what your needs are and I will be in touch. Wedding Sites and Resort locations. and Surrounding East Coast States. Please feel free to call for an appointment.